Surrealism in the news today. And after the Israelis decided that they really didn’t intend to pay the Palestinians to kill them, the Europeans (who know a thing or two about killing Jews) stepped right in to make sure that every Palestinian Arab can afford the explosives he needs. Hamas has scaled back its use of violence in recent years, halting suicide bombings and reining in the firing of rockets at Israel. Still, Hamas militants in the West Bank were responsible for a number of shootings of Israeli settlers in the West Bank last year. Last month, Hamas militants in Gaza fired an antitank missile at an Israeli school bus, killing one child. The bus had been full a few moments before. It was a highly accurate laser-guided weapon. Diana Buttu, a former aide to Mr. Abbas, said she expects a joint Fatah-Hamas strategy on Israel would mean Hamas gives up violence, while Fatah abandons its strategy of negotiation. That could lead to the pursuit of legal action against Israel, civil disobedience and popular protest campaigns. Maybe they’ll fire rockets containing subpoenas or respectfully refuse to obey the law against murder. “In order to stop the unilateral process of recognizing a Palestinian state and get us off a track that is bad for Israel, Netanyahu must negotiate,” [Kadima leader Tzipi] Livni said. “For him to be believed, he must pay prices. Israel hasn’t paid enough ‘prices’. The Oslo concessions and Gaza withdrawal don’t count? A ten-month freeze didn’t work, but a 3-month extension would have. The ‘world’ would stop pushing a Palestinian Arab state if only Israel had a left-wing government. I was going to write about something entirely different today, but the following description of ‘smart warfare’ as it is to be practiced by the IDF was so surreal, that I couldn’t let it go by. …during the Gaza operation, even after every effort had been made to induce civilians to evacuate areas where combat was expected — for example, by dropping fliers and making direct telephone calls to area residents — more often than not some non-combatants stayed behind. The new doctrine requires that after efforts have been made to warn the civilian population to leave, the incoming troops first fire warning shots and give the remaining civilians a chance to leave safely. Then, to minimize casualties among civilians who nevertheless choose to stay, IDF fighters and commanders must use the most accurate weapons at their disposal and choose munitions of relatively low impact. Another step the IDF has taken to help minimize civilian casualties and humanitarian distress on the other side is to attach humanitarian liaison officers to troops in the field. The officers come from a pool set up by the Coordinator of Government Activities in the Territories, or COGAT, and are in regular contact with the Palestinian Authority in the West Bank and international aid organizations in Gaza. Their task in the event of hostilities is to help coordinate humanitarian needs on the Palestinian side and to point out locations of sensitive facilities like hospitals, schools and U.N. aid centers to ensure that they are not mistakenly targeted. Such officers were assigned during the Gaza War on an ad hoc basis and, according to the IDF, proved very effective. There is something crazy going on here. Can you imagine ‘humanitarian liaison officers’ in contact with the Germans hitting the beach on D-Day? A few days ago (“War is Heck“) I facetiously predicted that the IDF would be issued rubber bullets for combat operations. Are these the “munitions of relatively low impact” that they are talking about? During the Gaza war, Hamas headquarters was said to be located in the basement of al-Shifa Hospital (which incidentally was rebuilt by Israel in the 1980’s in order to improve the living conditions of Gaza residents). The IDF did not attack it then and certainly would not get permission from its humanitarian liaison officers to do so in the next war. Hello, UN? We’re going to try to destroy the Egyptian air force on the ground before they can provide cover for an invasion to wipe us out. What? The Turks don’t think it’s legal? No, not without 1) dropping leaflets, 2) making phone calls, 3) firing warning shots, and 4) waiting for the planes to take off — er, for any civilians to leave. Seriously, how does this play when the enemy deliberately locates itself in civilian areas, fires missiles from school courtyards, etc? It means that the IDF will never have the advantage of surprise, and that in most cases it will be prohibited from shooting back when attacked, at least until long after the enemy is gone. On the other hand, groups like Hamas and Hizballah are exempt from any kind of humanitarian standards. They would simply laugh if anyone suggested that they should be careful about how many Jewish civilians they kill — after all, their objective is to kill all the Jews they can find! The international community will (sometimes) criticize terrorist groups when their actions are shockingly outside the window of acceptability, such as in the case of the murder of the Fogel family. But even then it’s tempered by a sort of “boys-will-be-boys” attitude: they are terrorists, it’s regrettable, but what can you do? But if nothing can be done about the terrorist groups, all the responsibility is placed on Israel. All of the casualties are seen as Israel’s fault, regardless of the circumstances. Israel must refuse to accept this responsibility — it must maintain the absolute right to defend its population and soldiers, regardless of the tactics its enemies use. Since the terrorist groups deliberately use the civilian population as a shield, then the responsibility for civilian deaths should fall on them. But by adopting the “smart warfare” techniques described above, the IDF in effect accepts responsibility and gives the terrorists a pass. The IDF is falling into a trap: if it admits that it could stop all collateral damage by ‘fighting smarter’, then any collateral damage at all means that it is not trying hard enough. And it means that the damage is its responsibility. The terrorists fully understand this and continue to try as hard as they can to put their own population in harm’s way. The IDF then responds by adopting stricter rules of engagement, which makes it harder for it to defeat its enemies. Israel can not win against this kind of escalation, because it is not possible to fight a war in a populated area without hurting anybody. The solution is to establish reasonable rules of engagement that will result in a minimum of collateral damage consistent with achieving its military objectives, and stick to them. If terrorist tactics cause an increase in civilian casualties, that’s their responsibility, not that of the IDF. JERUSALEM (JTA) — Human Rights Watch called on Hamas to open an investigation into alleged war crimes. The organization sent a letter Tuesday to Gaza Prime Minister Ismail Haniyeh calling on Hamas to launch a “credible investigation” into the alleged violations highlighted in the United Nations’ Goldstone report, according to reports. Can you stop laughing? I can’t. HRW: We want you to launch an investigation of the allegations that you “may have committed war crimes” when you fired 10,000 rockets and mortar shells into Israel over a period of 8 years. HRW: But you aren’t supposed to wage jihad against unarmed civilians. IH: Oh yes we are! Our covenant says “Israel, Judaism and Jews challenge Islam and the Muslim people. May the cowards never sleep.” That means all Jews, in uniform or not. HRW: So you want the Jews out of the lands they unjustly took in 1967? IH: No, we want them out of all occupied territory, from the river to the sea. That’s what the covenant means when it says “The Islamic Resistance Movement believes that the land of Palestine is an Islamic Waqf consecrated for future Muslim generations until Judgment Day. It, or any part of it, should not be squandered: it, or any part of it, should not be given up.” No Crusaders or yahood allowed. HRW: Oh, I see. Sort of like what our Saudi donors are always saying. But what will become of the Jews when you drive them out? With their money, they took control of the world media, news agencies, the press, publishing houses, broadcasting stations, and others. With their money they stirred revolutions in various parts of the world with the purpose of achieving their interests and reaping the fruit therein. They were behind the French Revolution, the Communist revolution and most of the revolutions we heard and hear about, here and there. With their money they formed secret societies, such as Freemasons, Rotary Clubs, the Lions and others in different parts of the world for the purpose of sabotaging societies and achieving Zionist interests. With their money they were able to control imperialistic countries and instigate them to colonize many countries in order to enable them to exploit their resources and spread corruption there. They were behind World War I, when they were able to destroy the Islamic Caliphate, making financial gains and controlling resources. They obtained the Balfour Declaration, formed the League of Nations through which they could rule the world. They were behind World War II, through which they made huge financial gains by trading in armaments, and paved the way for the establishment of their state. It was they who instigated the replacement of the League of Nations with the United Nations and the Security Council to enable them to rule the world through them. There is no war going on anywhere, without having their finger in it. HRW: (shocked) The Lions Clubs? Is there no limit to their perfidy? HRW: OK, you may be justified if they are as bad as all that. But if I can give you a tip, be careful what you say about women. Sexism is out today. There is growing support in the government and in the Knesset for the release of jailed Fatah leader Marwan Barghouti, who is considered a top contender to replace Palestinian Authority President Mahmoud Abbas in the future, and who is possibly the most popular figure on the Palestinian street. 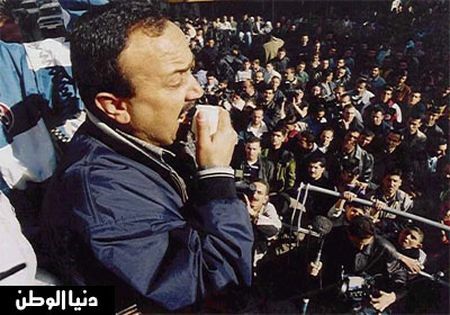 Barghouti is seen as a relatively moderate force in the Palestinian leadership. In 2006 Barghouti was involved in shaping what became known as ‘the Palestinian prisoners’ document,’ which called for the establishment of a Palestinian state within the 1967 borders. It was signed by prisoners representing of all major Palestinian factions including Hamas. It is strange to hear this about someone who is serving five life terms for masterminding an equal number of murders (and those are just the ones of which he was convicted). But stranger things have happened — Israel invited Arafat back from exile in 1993 (and we know how that turned out). The fact is that while Barghouti does have a lot of support among Palestinians, it is precisely because he is not moderate. Remember, 77% of Palestinians say that “the rights and needs of the Palestinian people cannot be taken care of as long as the state of Israel exists” (Pew survey, 6/27/07). [G]iven the cult of violence and total victory dominating Palestinian political culture Hamas is inevitably seen as heroic because it fights and rejects compromise … Compromise is treason; moderation is cowardice. This is the daily fare of Palestinian ideology and politics, purveyed by leaders, clerics, media, and schools. 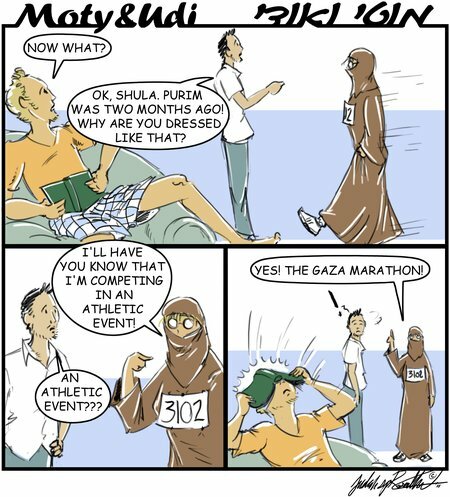 The spate of militant resolutions recently passed by the Fatah convention also illustrates this. Now imagine that you could have the militancy of Hamas without the Taliban-like religious coercion, and Fatah’s international acceptance without the corruption. Add a person with intelligence, a good strategist with organizational ability, and one who can talk to all factions. This is why Barghouti is appealing to Palestinians. If he were in the opposition in any Arab country, he would have been hanged long ago. Barghouti is not moderate: he is pragmatic. There is a difference. Barghouti’s “Prisoner’s document“, as I’ve written before, is not a ‘moderate’ document. It calls for a Palestinian state with its capital in Jerusalem; the joining together of Fatah, Hamas and Islamic Jihad into a unified PLO which will lead the Palestinians, the return of refugees and release of prisoners “on the land of the fathers and grandfathers” — Israel proper; and “the right of the Palestinian people in resistance and clinging to the option of resistance with the various means”. There is a suggestion of limitations on violence — but just between Palestinian factions! It makes no mention of recognition of Israel. Indeed, the word ‘Israel’ does not appear in any of its 18 points. Thus we come to a reductio ad absurdum of the ‘peace process’. Here we have someone who is in jail for multiple murders of noncombatants (one victim was a Greek monk). He’s a proven terrorist, committed to violent ‘resistance’ against Israel. Indeed, because of his militant credentials, he is the only one that Hamas, Fatah, Islamic Jihad, etc. could agree to follow. He is likely to be an effective leader of the Palestinian ‘struggle’. One would think that this is the last guy that Israel should let out of jail. But it is considered necessary for the peace process that there be a unified Palestinian entity to negotiate with. What does this tell us about the ‘peace process’? You know, maybe it’s because today is tisha b’Av and I’m not dealing too well with the fast or maybe it’s something else, but it’s probably a good thing that I do not personally possess deliverable nuclear weapons or a Fist of Death. For the third year in a row, Israel fared very poorly in the Global Peace Index, being placed just 141 out of 144 countries, and ranked more peaceful than only Iraq, Afghanistan, and Somalia. Published by the “Vision of Humanity” organization, the index has a stated aim of measuring peace through the “absence of violence.” To do this, the group employs 23 different indicators which are then modified by various variables to produce a final score. Countries which were considered more peaceful than Israel in 2009 included Sudan (140), Pakistan (137), Lebanon (132), North Korea (131), and Iran (99). Let me also mention Syria, which, despite arming Hezbollah and supporting insurgents in Iraq, still earned a 92. Of course, Hamastan and the Palestinian Authority (PA) aren’t countries yet, so they don’t appear. I’m sure that the 1939 Global Peace Index put Poland near the bottom for “poor relations with its regional neighbors”, and downrated Czechoslovakia for its low respect for the human rights of those Sudeten Germans. I could say that Israel should certainly be credited for withdrawing from Gaza and for making concession after concession to the PA which doesn’t even recognize its right to exist. I could say that judging the ‘peacefulness’ of a nation without taking into account who precipitated the wars that it has been engaged in is a little misleading. I could say that counting military expenditures as a percentage of GDP without considering external threats is pointless. But why bother? You already knew that anybody calling themselves “Vision of Humanity” had to be a bunch of idiots. Must… control… Fist… of… Death.